I cannot believe that just one year ago I was waddling around waiting for D to arrive. It seems like a lifetime ago. Her birthday is less than a month away and we’re in the midst of figuring out what we are going to do. This summer is jam packed with weddings, showers, birthday parties and BBQs. There are have been times when I wished I had something to do, some fun party or festivity to attend here in my lonesome boonies so far from home, and for all the times I ended up bored silly strolling the mall or taking a random drive by the water, this summer makes up for it ten-fold. With all the madness of this summer (much welcomed, really), we’re thinking of keeping D’s first birthday celebration to a small little fete at J’s aunt and uncle’s house. J and I have both taken the day off to spend with D and will try to cramp in as much fun as we can (zoo, children’s museum, beach…the choices are endless, I imagine a blanket in the grass with some toys would overjoy her more than anything) and wind up our day with friends and family for a good ole fashion BBQ. Since my family can’t make it up for that weekend, they’ll be hosting a brunch for D in late July. I’d like to say that it will be a small gathering but nothing is ever small and quaint in NJ amongst Cubans. The planning for the brunch has to wait until after next weekend, though, when we’ll be attending my friend’s 3 day wedding event. I can’t even begin to wrap my brain around planning until that’s over. D loves this! She got to ride it at the local children’s museum and couldn’t get enough. And the fact that it flips over into a mini-walkway is perfect since we live on one level and D could use it to practice going up and down steps. This is J’s fave. He won’t stop asking when we can get it for her. She’s too young to actually use it with all the furniture and accessories (can you say choking hazard?) but it will look good in her room and make for good storage of a stuffed animal or two. I can’t lie, I love it too, the modern dollhouse just kills me…i adore it. I have to say, though, that I’m more excited about the traditions and keepsakes we’ll be creating and giving to D than I am about the gifts. I am a person of habit and ritual and tradition. Oh, and being an only child, I’m a big believer in having personalized items. So while, J counts down to the dollhouse and rocking boat, I’ll be gathering some of the following goodies for D’s birthday box for this year’s celebration and those to come. Growing up I had my own set of utensils – a simple knife, spoon and fork each with a splash of pink. They were (are) mine and no one else could use them. I love how special it always made me feel. That’s what these remind me of…a unique way to celebrate a birthday. I’d love to get the set of 4 plates and use them only for birthdays. They come wrapped in boxes that stack to form a birthday cake…genius! Life I’ve mentioned before, I L-O-V-E me some charm bracelets. A birdy told me mami got on for D so I can’t wait to see it! 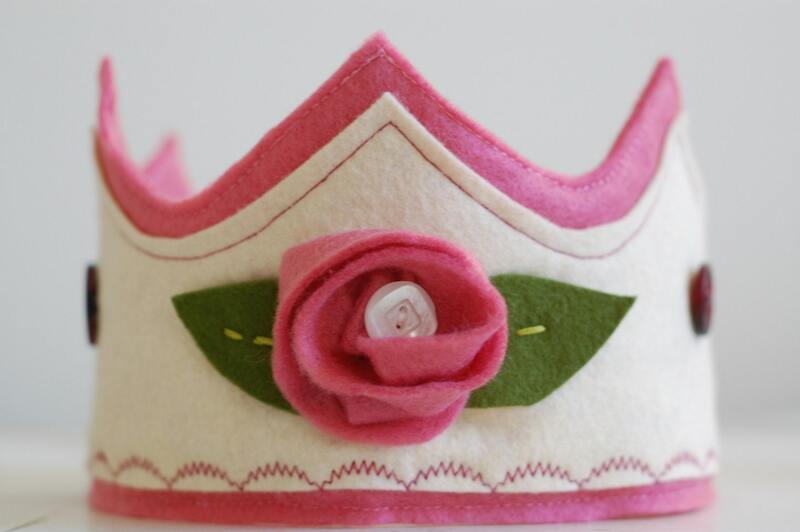 I’ve been thinking about this felt crown since D was born! The first is from this lovely shop and the other aSoulemama inspiration. I own The Creative Family, so J and I went and got our supplies to make D her very own crown. Not sure how it will turn out but should be a fun project. If it turns out to be a disaster, then we’ll order one and have it in time for the NJ brunch. Another Soule inspiration. 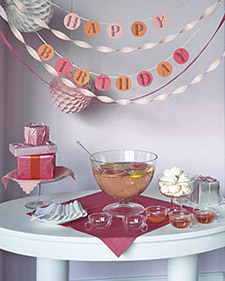 The birthday banner is all over the place and it makes sense: special occasion decor, everyday nursery decor, yearly birthday banner, insane cuteness – what’s there not to love? I just have to figure out how I will make D’s. The design for the first two is pretty easy and will last forever. The ease of making a paper one appeals to my lazy self and the Moo banner rocks it hard for the total bum in me! My head is spinning now with all the ideas I’ve got going for D’s big 1st. But my eyelids are heavy…goodnight! Interesting post and thanks for sharing!! I also celebrated my daughter’s 1st birthday last week. Got some cute and adorable gifts from Current Catalog for my sweet daughter.